Soothe skin after sun exposure with the Filorga UV Bronze After Sun Gel; a triple action gel-to-oil formula with a light and refreshing texture that pacifies and calms the skin after a tanning session by the poolside. Enriched with a combination of four essential oils (Argan, Apricot, Almond and Avocado) with Hyaluronic Acid and an amino acid complex, the formula nourishes and intensely moisturises the skin, whilst a Tan Stimulator Complex prolongs your sunkissed glow. 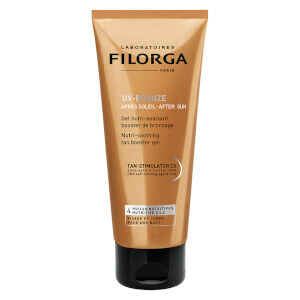 Apply evenly to areas on face and body that have been exposed to the sun.